The raincoat is protective, waterproof, PVH+NEYLON material. 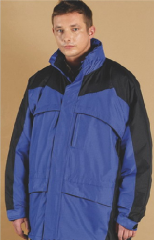 With the central fastener on lightning and on plastic buttons, sewn hood, developing in collar, 2 patch pockets with valves, seams are in addition glued, length of 120 cm. 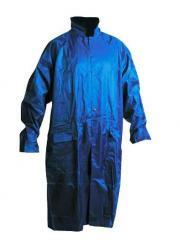 Reliable protection against rain and moisture. Jacket warmed "ANDES" With the warmed hood, 7 pockets, cuffs regulated on buckles will pull together belt with cord, fastener on lightnings, heater from synthetic winterizer. Color: dark blue. 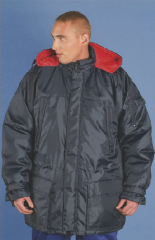 The raincoat from polyvinylchloride with the central fastener on lightning and on plastic buttons, with hood, 2 patch pockets with valves, length is 120 cm. 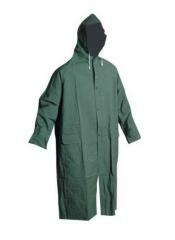 Reliable protection against rain and moisture. 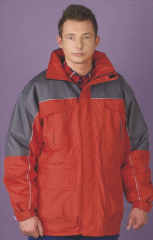 Unbelievable price on Protective clothing, raincoats and jackets in Kharkov (Ukraine) company APS-SPECODEZhDA, OOO. Wide choice of quality products at affordable prices.